In this long-awaited sequel to the legendary graphic novel Kings in Disguise, a young circus hand gets involved in dangerous underground activity. Kings in Disguise was praised by the likes of Art Spiegelman, Neil Gaiman, and Alan Moore. It won two Eisner Awards and has been hailed as one of the ten best graphic novels of all time (Guardian). This highly anticipated sequel tells the story of a young man’s coming of age in a world where the capacity to dream may be a fatal flaw. 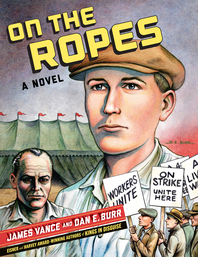 Set in 1937, On the Ropes continues the story of Fred Bloch, now apprenticed to escape artist Gordon Corey, a star attraction in a traveling WPA circus. Though damaged by the Depression and haunted by past mistakes, each man holds the key to the other’s salvation—but each also harbors a secret that could lead to their mutual destruction. Enacted against a backdrop of violent labor unrest and a nation’s faltering recovery, On the Ropes is a breathtaking visual achievement that delivers a powerful, timeless story.